Get ripped faster by learning the rules of the ripped and choosing the right lean muscle formula. Whether you’re trying to build lean muscle mass, drop a few kilos or blast the fat covering your lower abs, you need a specialised approach to your diet and supplements. 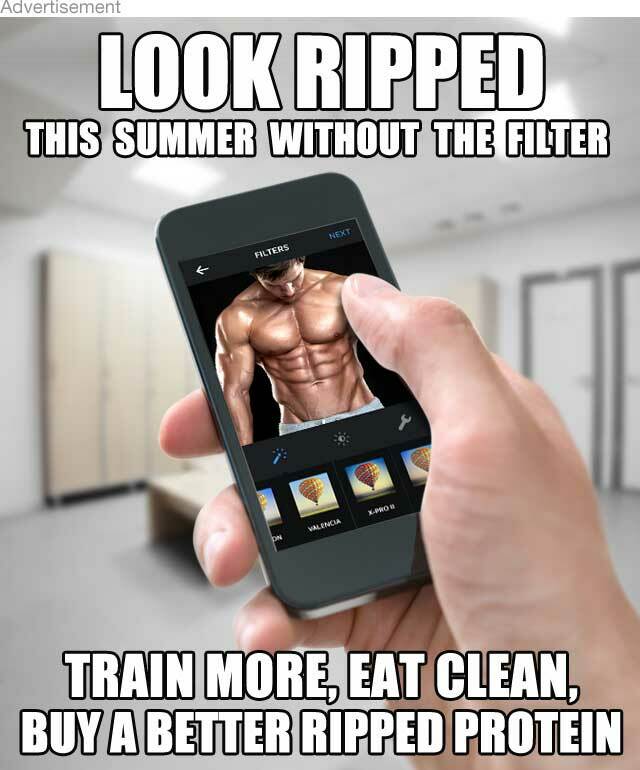 It is a common saying that getting ripped (and staying that way) is 70% related to what you put in your mouth and 30% related to what you put in at the gym. No matter how hard you train at the gym, if your food intake is letting you down then that may be why you are not seeing the result. The key nutrient for success is protein. This is why choosing the right protein formula to get the right results is so important! There are many ripped, lean and shredded type formulas on the market. Some are good, some are not so good and surprisingly there are some which are terrible. To help you get through all the marketing and on-pack jargon, here is a quick check list to help you decide if your current lean muscle formula is up to the task of building lean ripped muscle tissue. [icon name=icon-ok] High Protein (greater than 75g per 100g e.g. : +75% PROTEIN). Protein is the building block of muscle, so it goes without saying that you need your ripped protein formula to be jam packed with protein. [icon name=icon-ok] Low Carbohydrate (less than 8g per 100g): Carbs aren’t always the enemy, especially if you have a cardio intensive lifestyle, but if you are in a lean and ripped muscle growth phase, keep the carbs in your protein formula to under 8g per 100g. Chances are you are probably getting carbs from other parts of your diet, so keep away from high carb protein formulas (these products are for trainers on a Mass Size and Muscle Growth phase). [icon name=icon-ok] Added thermogenic fat burners: There are lots of these ingredients, all with different clinical studies and research. Two of the most popular in ripped protein formulas are L-Carnitine and African Mango Extract. Both have clinical data supporting their use for the transportation of fat across cell membranes and metabolic pathways resulting in body fat reduction. [icon name=icon-ok] High in Branched Chain Amino Acids (BCAAs): These are core amino acids for misuse tissue repair, recovery and growth. A formula packed with these super amino acids is best for lean and ripped muscle growth. [icon name=icon-ok] Containing Whey Protein Isolates & Concentrates (check the ingredient list): Whey protein is regarded as one of the best sources for human muscle tissue growth, so your lean muscle formula should be packed with whey proteins that are rich in amino acids as well as being lower in fat and carbohydrate than milk proteins, milk solids or milk powder. [icon name=icon-ok] Made by a trusted Australian brand (containing no proprietary blends or hidden ingredients): Not all ripped proteins (particularly those manufacturered overseas) have ingredients and nutritional facts clearly available. Most of the Australian and NZ brands are proud to display the credentials of their products, so as a general rule, if you see words like ‘proprietary blend’ or the nutritional panel doesn’t have a per 100g column, beware. Vitalstrength Hydroxy Ripped is an advanced lean muscle formula that ticks all the boxes and is specifically designed to help you build ripped lean muscle without adding unwanted fat. 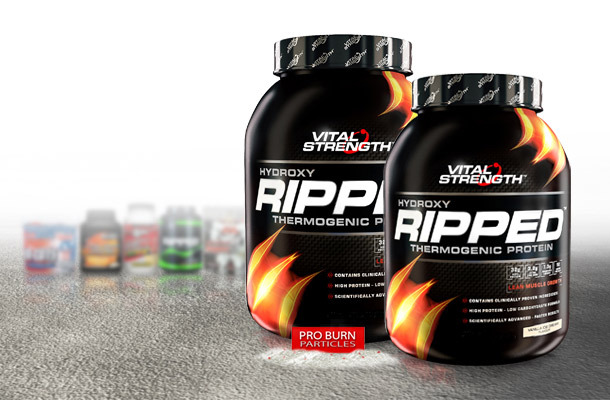 Vitalstrength Ripped is a high protein, low carboydrate formula that features a tri-phase protein system, including whey protein isolates to help prolong fat metabolism and lean muscle growth post exercise. Plus a powerful T4 thermogenic complex, including L-Carnitine, African Mango Extract, Chromium Picoliniate and Choline to blast fat fast. Ripped is also power-packed with muscle building BCAAs- Leucine, Iso-Leucine and Valine for proven muscle recovery and lean growth. This super shredding lean muscle formula works hard to get you ripped muscle results, faster!